Jeff Johnson lives a life that many would envy. He’s given up things like a permanent address, family, and material wealth, choosing the “dirtbag” existence that allows him to travel on a whim and seek adventure where he can. 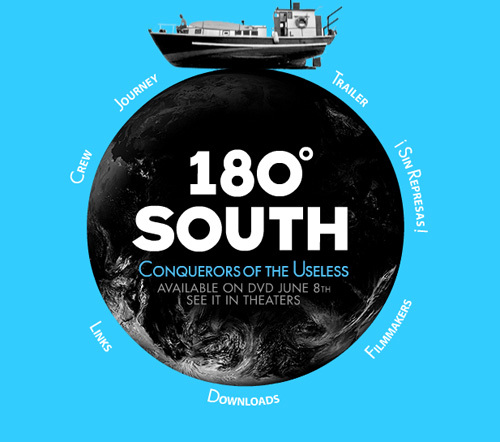 That’s a jumping off point for “180 Degrees South”, a new movie from Woodshed Films. 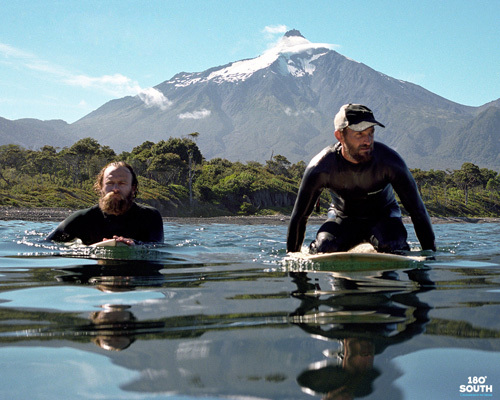 It is directed by Chris Malloy, a former professional surfer, and it follows a particularly epic adventure of Johnson’s. Johnson, along with a few friends that join him, attempts to follow the course of a 1968 journey that a couple of his heroes made. Yvon Chouinard and Doug Tompkins left from California, driving south through Mexico, to Chile’s Patagonia region, surfing as they went. Once there, just as the 1968 travelers did, Johnson will attempt a summit in what is now the park Conservacion Patagonica. Specifically, he will climb the peak Cerro Corcovado. Along the way, Johnson catches boat rides, surfs, mingles with locals and attempts to learn about the struggles of the area. His journey takes him through some amazing places. For weeks, he’s stranded on Rapa Nui, better known as Easter Island. While there he meets a beautiful local, Makohe, who joins him on the journey. “180 degrees South” is not really a surf film, or a climbing film, or even an environmental film, yet it functions as all of these somehow. In a melancholy, yet beautiful and thoughtful way, the film tells a story of true exploration and adventure. True to the experience, the film is a little slow moving, with very little action. However, there is plenty of adventure — broken boats, unexpected layovers, and joyful discoveries mixed with heartbreaking realities. There is a refreshing lack of exaggeration to the film. A few short sections of animated overlay help you imagine what the narrator is thinking. The movie also deals with something that I see as becoming more and more important. The wild places that we enjoy and utilize need to be protected. Currently, the Chilean government is planning to use Patagonia as a resource for power — with plans to build half a dozen hydroelectric dams. At best, it will be a temporary fix with no concern for sustaining the natural resource and way of life. Unlike a lot of environmental films, the message here is presented in a very reflective, non-shaming way. And the name, “180 degrees South”? 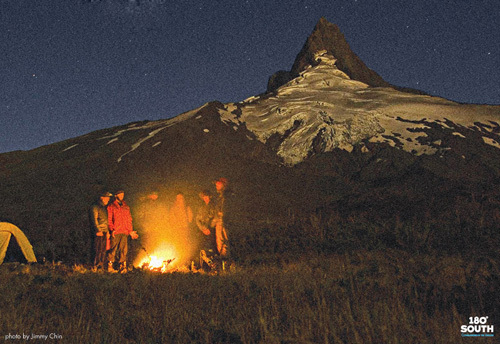 Near the end of the film, it is implied that part of the way to undo our current, destructive path is to “turn around and make a forward step.” If Patagonia is “like being in Wyoming or Montana 100 years ago,” as the film states, what can be done to see that it stays that way? Part of the answer seems to be buying huge tracts of land and fencing it off from development, as Doug Tompkins has done there. Though I think the filmmaker expects the message to be something along the lines of “consume less.” Either way, a slice of the responsibility falls on we adventurers since we are among those who may value wild places the most. If embellished action and fast-paced music make up your kind of outdoor film, then skip this one—it was made by a bunch of chill characters. If you like a good story with a message of responsible eco-tourism, beautiful footage, and a great, mellow soundtrack, then I think you’ll enjoy this film. Be warned, though. After watching this film, you may find yourself packing for “destination unknown” and heading to sea on a boat of your own.